These days the garden is thought of more as an extension of the home. With play areas, barbecues, landscaped gardens and patios it is definitely a part of your home that is often in use. Have you thought about adding a summerhouse to your garden; it is easier than you think. Whatever design you choose a summerhouse can be quite a large construction on your plot. When deciding on this addition to your garden peg out the area and make sure that it fits in and does not become a blot on your landscape. What exactly do you intend to do with your summerhouse? Will it be just a storage area for gardening tools, patio furniture etc? If this is the case it may be better and cheaper to purchase a shed. 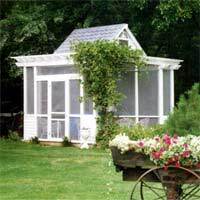 Summerhouses tend to have large window areas and no one wants to see through a window into lots of unused equipment. Inevitably the extra room will just become a dumping area and never used as an addition to your home. Do not purchase your summerhouse on an impulse instead visit garden centres and look online at what is available to you. The prices can vary quite a lot so make sure your summerhouse is affordable and fits the use for which it was intended. It is possible that you will need planning permission for your summerhouse. Check with the planning department of your local council about this. Quite often you do not need permission however it is best to check before spending money that could later be wasted when you have to dismantle your building. It is an idea to get a reply in writing so that if at a further time there is a query with your summerhouse you have proof that you were told that planning permission was not needed. Like sheds most summerhouses are delivered in a flat pack state with instructions on how to assemble. If this is completely beyond your capabilities the company selling the portable building will no doubt offer an erection service. This service will come at a charge so if you are working to a tight budget why not check first that you do not have a friend or relative that could help you erect your summerhouse? It is enough just to have your summerhouse erected on top of a level ground with paving slabs as a base. However, by digging a trench and laying rubble and cement you will have a stronger, more durable base that will be better if you intend to use your summerhouse as another room and an extension to your home. By insulating the walls of your summerhouse, having proper footings and a base and sealing the timber walls with a good quality product this new addition to your home can last for years. Use it as a spare bedroom, a den for teenagers or even an office or a retreat for mum when life gets too harassing. Remember to add locks to the doors as like a shed or any other garden building it could attract burglars. If you are planning to have a swimming pool in your garden a summerhouse could be the ideal answer to where your family and guests are to change from their wet clothing. Run electricity to the building so that you have lighting and heating for year round use. If you have room for a summerhouse the chances are that you will also have room for a log cabin. These small buildings tend to have several rooms including a kitchen and a bathroom and like a summerhouse come in a flat pack state ready for erection. Again planning permission may be needed so check this out before parting with your money. With thee interesting buildings even being on sale from high street catalogues stores and online it is easy to see what they look like and find one to fit your budget. Buying an Old Property to Demolish: A Good Way to Buy a Plot? Log Burning Stoves: Do You Need Planning Permission? Staircases: What Type? What Will Fit? Limited Space? Can I sell my sell my self build house without 10yr garantie To cash buyers? Our solicitor doesn’t seem to know! Thanks.